The city of Halifax is inviting residents to share their thoughts in what's so far been a staid, respectful debate over how best to replace the current Africville dog park. 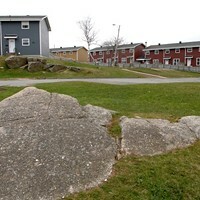 On July 23, compassionate citizens can calmly assemble at the Halifax Forum to deliberate on whether the proposed strip of land to the right of the Africville Park parking lot would serve as a suitable alternative fenced-in, off-leash area. Surely, there will be no dismissal of civic history as municipal officials and the informed public work together to identify a replacement and return the lands of Africville back to not being a place designated primarily for dogs. Council has hopes that the new park will be in place by the end of 2014, and then that'll be the end of racism in Halifax. Anyone not able to attend the consultation session on July 23 can voice their feedback to Holly Richardson in Real Estate and Land Management. But this isn't really a topic anyone has had thoughts about recently, so I doubt she'll receive many emails. Direction 180 finds harsh welcome from fearful communities.